1929 Riley 9 car sold at WJC Motors in 1933. Homepage. This page: On the 26th September 1933 a token deposit is left on a secondhand (1929) Riley 9. Mr Percy George Brooks was, in the 1930s, a serial replacer of cars. For example in 1935 he bought himself a secondhand Crossley saloon at the Manor Motor Co. Ltd. Less than two years earlier he signed on the dotted line for a secondhand Riley 9 saloon (photos of several 9hp Monaco saloons can be found on this page), which had been on sale at W.J.C. Motors of 225 & 227 Hammersmith Road, London W6 - a "specialist in second-hand cars". 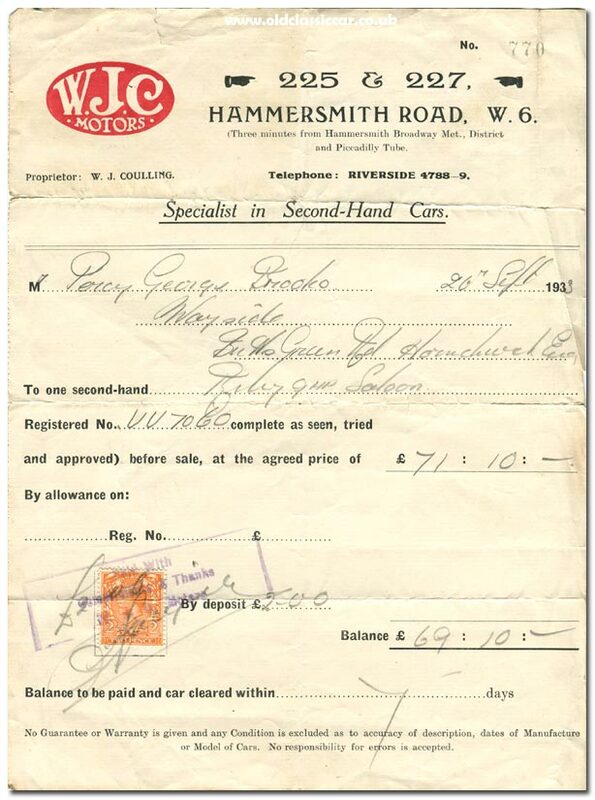 The car in question was registered UU 7060, from a London registration series that had a short run - ie May to June 1929. The asking price was a whisker over 71 GBP, and this receipt confirmed that 2:0:0 had been left in deposit. Hopefully Mr Brooks had taken a close look at the vendor's terms and conditions, as it states that "no guarantee or warranty is given and any condition is excluded as to accuracy of description, dates of manufacture or model of cars. No responsibility for errors is accepted". I doubt WJC Motors (Proprietor: W.J. Coulling) or any other garage would get away with such terms today, especially on what was - at the time - a relatively young car, at just four years of age in 1933. Quite how long the business remained trading for can be estimated by the fact that, in the 21st December 1945 issue of The London Gazette, the company is listed amongst those now classified as officially dissolved. Had Mr Coulling retired, or had perhaps the effects of WW2 brought the curtain down on his business? References to his activities are few and far between, and I can't find anything later than December 1945. More period items relating to old vehicles can be found in the Motoring Collectables section of the site.